I discovered this delicious drink at All Spice restaurant in San Mateo, and I was hooked. I’m a big lover of sweet lassis, and I couldn’t believe I had never had a mint one before – when it seems like such an obvious flavor combination. I wasn’t sure what the pomegranate contributed – I still don’t know – but the drink at the restaurant was so delicious I just had to try it myself. I can’t tell you the proportions as I simply combined the yogurt with the lassi until it had the right consistency and then added honey until it was sweet enough – beating with an immersion blender, but you can just put everything in a blender. I then added mint until I could taste it. I tried it with both fresh and dried mint, but dried mint works far better. The key to this lassi is to let it rest for at least half an hour before serving, as the flavors need time to combine. But make it, you won’t be disappointed. I’ve never been much of a fan of flavored teas, I like black tea enough as it is. I’ll make an exception for Earl Grey, but that’s about it. I didn’t even begin tasting flavored teas until we started going, more or less regularly, to the Golden Tea Garden in Hayward. The owner is a huge flavored tea aficionado, and her menu of teas reaches into the dozens, if not hundreds. Every time she gives you a taste of something new and features special flavors. I still always order black tea, but the girls and whoever else comes with me freely explore the flavors. Last week, as I was considering Christmas presents for the kids, I remembered how much Mika loves caramel tea and decided to buy her some. Browsing through Amazon.com, I was amazed to find out just how expensive caramel tea was! Fortunately, I eventually came about ESP Emporium teas. ESP Emporium is an online tea specialty store selling all sorts of exotic, flavored and regular teas, as well as tea making/drinking equipment. Basically, they seem like a competitor to Teavana. Fortunately, they price the items they sell through Amazon.com much more reasonably. More importantly, they have some amazing, if very fleeting, sales on items – I’m not sure if they are overstock or lower quality (the photos of what I got do not always match the ones on ESP’s website) -, but the prices are definitely attractive. I now make it a point to add in whatever ESP Emporium is on sale at a good price whenever I’m making a qualifying Amazon purchase. ESP Emporium sells teas either in canisters or in bags. If you buy them at Amazon.com, it’s very clear which you are buying. It’s much less clear on their website – I assume they all come in bags, but don’t really know. They both seal very well, but the canisters are difficult to open – so if you have arthritis, you may want to order the bags instead. That said, I prefer them in canisters. Also, please note the brewing time for each tea on the bag/container. Rooibos and fruit teas require longer times than regular black teas. I’ve been using my Keurig machine to brew the tea, as it’s very easy. You can usually get at least 3 10-oz mugs of brewed tea from each filled canister . But fill the canister, otherwise you’ll end up with a very weak tea. Also to note, I only recently realized that Chinese tea comes from China (duh!). I mean, I knew it, but Chinese tea has been such a commodity for centuries that it did not occur to me that it might suffer from the same problems of soil contamination that every other food from China does. Unfortunately, studies show that it does. It contains high level of lead, though fortunately the lead stay with the leaf and doesn’t make it into the tea itself. Still, I think I’ll be cautious and stop buying Chinese tea in the future. I’m also going to be noting where teas are made, whenever I can find the information. Goldrush Bergamot Lemon Premium White Green Tea Blend has green & white tea, white rose buds (I didn’t get any in the photo, but they’re there), yogurt granules and natural bergaot and lemon flavors. This is a pretty weakly flavored tea, not too citrusy, but enjoyable with quite a bit of sugar. 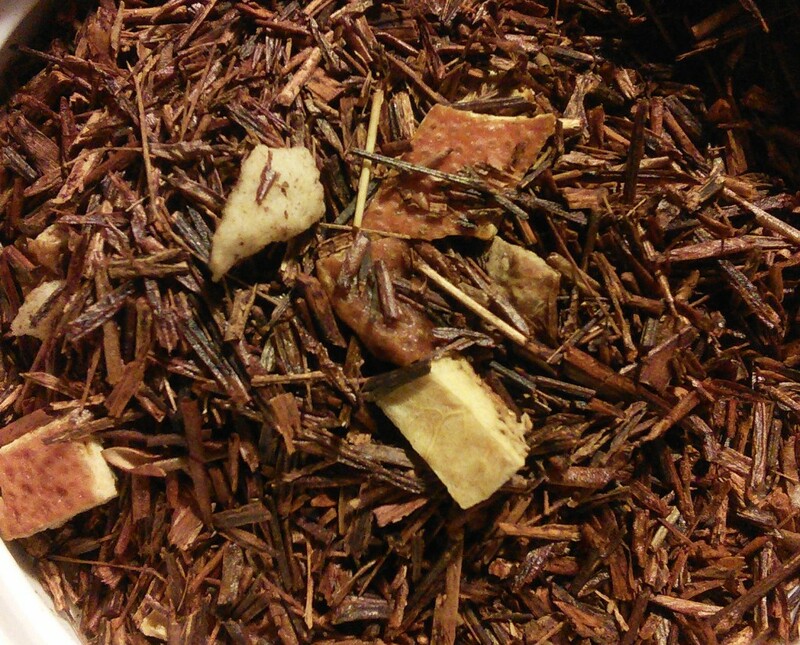 Pina Colada Rooibos Tea Blend is a mixture of Rooibos tea with pineapple cubes, coconut shreds and flavoring. I also really liked this light, fruity tea. It didn’t remind me of piña colada as much as it did of candy in general. But it was light, and easy to drink. Again, I felt it needed sugar and did best without milk. 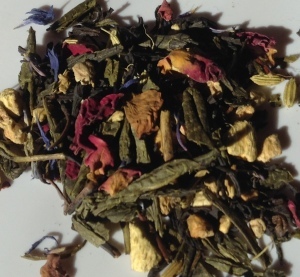 Sir Stuart is a blend of black and green teas with “ginger pieces, fennel, cardamom seed, flavoring, rose petals, cornflower blossoms”. This is a really nice tea. It is very balanced, with a grown up orangy flavor, a little bitter and a little bit spicy at time. I always drink my teas with sugar, and I felt this one really needed it for the full flavor to burst through. This is often my to-go tea when I don’t know what else to drink. Chocolate/Cream/ Truffles Black Tea Blend is a mixture of black tea with “broken cocoa bits, coconut shreds, chocolate chips” and “flavoring”. I got a bag of this one and the smell when you open it is unbelievable. The chocolate and coconut really come through and work well together, so that the end product is really neither. It’s very tasty though, but I do thing it needs both milk and sugar for the true flavors to shine – otherwise I found the tea sort of weak. 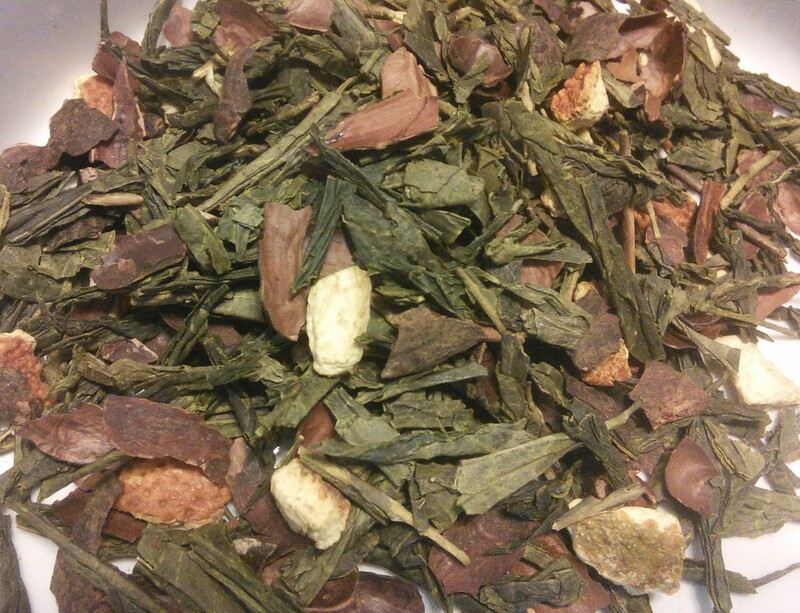 This is a Sencha green tea from China and includes cocoa peel, orange peel, cocoa pieces and other flavoring. I made this in my Keurig and I found it to be very weak. Of course, the Keurig doesn’t give it the 2-3 minutes seeping time this tea needs, but yet it does well with other teas that require longer seeping times. I will try it again using a tea kettle and report back. 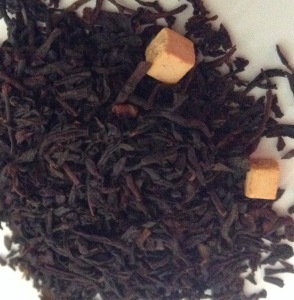 Caramel Black Tea Blend is black tea with caramel pieces and flavoring. It retails for $11.50 for 100g. I paid $3. I originally came across ESP Emporium while looking for caramel tea, so I was very disappointed at how weak this tea is, both in terms of caramel flavor and flavor altogether. This was the case both through a regular brew and in the Keurig. This black tea has cinnamon pieces, dehydrated maple syrup, cinnamon rods, popcorn, white cornflower blossoms and flavoring. I have to confess that I just loved that this tea came with popcorn. I don’t know if it added anything to the flavor, but just how cool is it to make popcorn tea? The tea, meanwhile was very good. It had a nice old-fashion caramel flavor and was definitely better than the caramel tea. 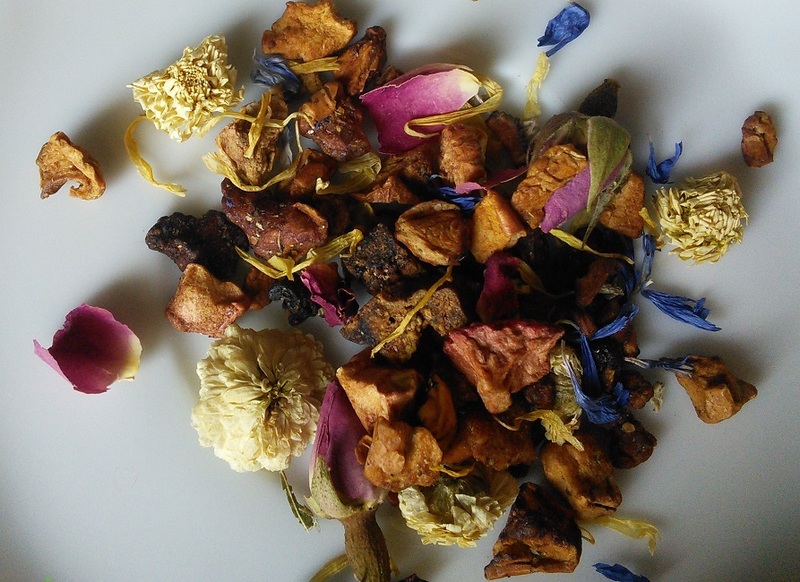 Flower Garden Fruit Tea Blend is a mixture of pieces of dried sour apples and pears, pink rosebuds, freeze-dried strawberry and raspberry pieces, blackberry leaves, cornflower blossoms, marigold blossoms, rose petals, Roman chamomile and flavoring. 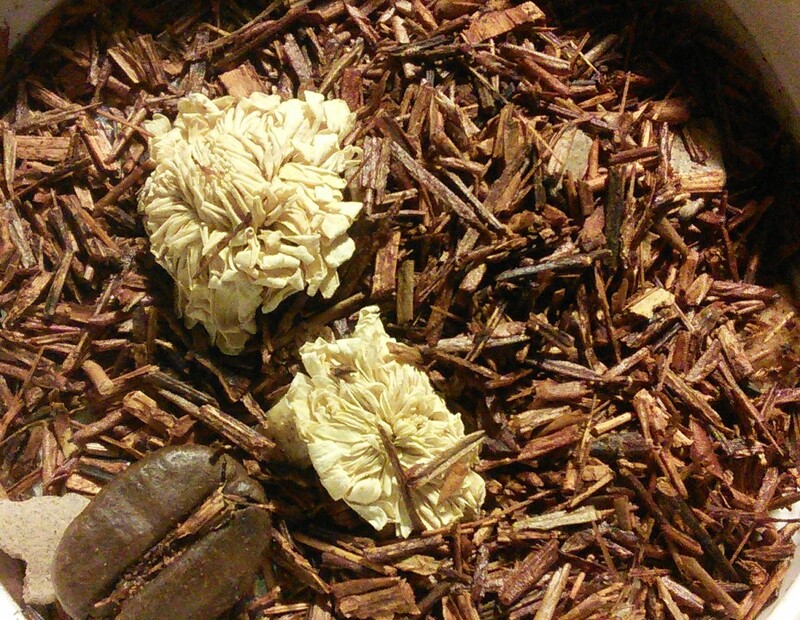 This tea is just beautiful, pretty much just a combination of flower bulbs. And it tastes like flowers too. If I had to describe it, I’d say it’s mostly like a rose hip tea. Definitely needs sugar to bring up the flavors, though. 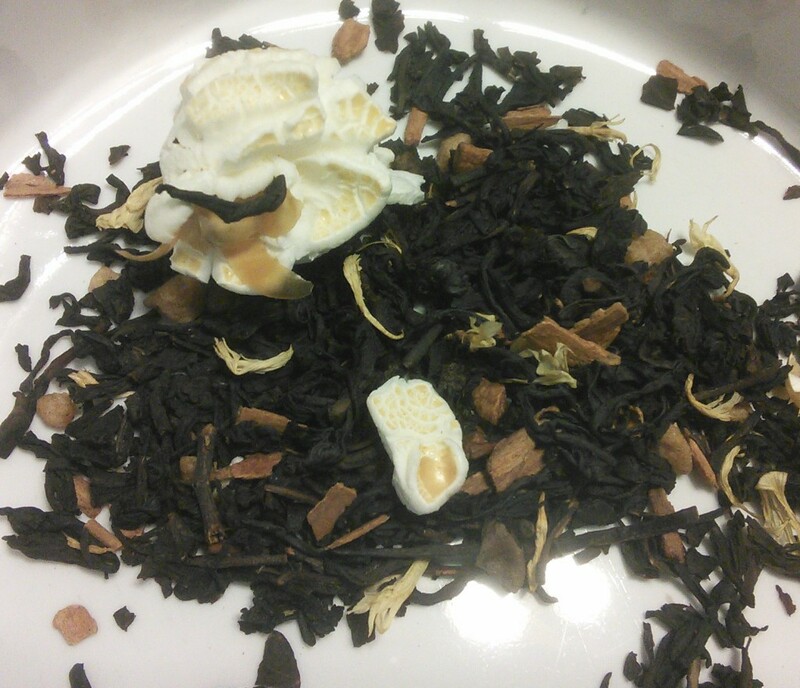 Creamsicle Rooibos Tea has rooibos tea, flavoring, orange peel and freeze-dried yogurt pieces. I guess I was expecting this to taste like an orange creamsicle, but it tasted like a very good, very balanced cup of tea with milk. It was really nice, and definitely something to keep in the pantry for when you want just a classic tea with milk, but have no milk around. 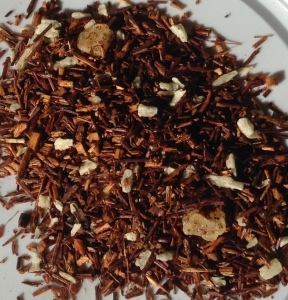 Tiramisu/Mascarpone Rooibos Tea adds chocolate chips, brittle pieces, caramel pieces, freeze-dried yogurt pieces, roasted coffee beans, Roman chamomile and flavoring to the rooibos tea. I’m not sure I can see all those ingredients in the tea, and perhaps that’s why it doesn’t actually taste like either Tiramisu or Mascarpone or a combination of either. It lacks the sour element of both, other than perhaps as an aftertaste. While I can’t quite describe the flavor of this tea – beyond being a well balanced rooibos – it is very pleasant, with or without milk. 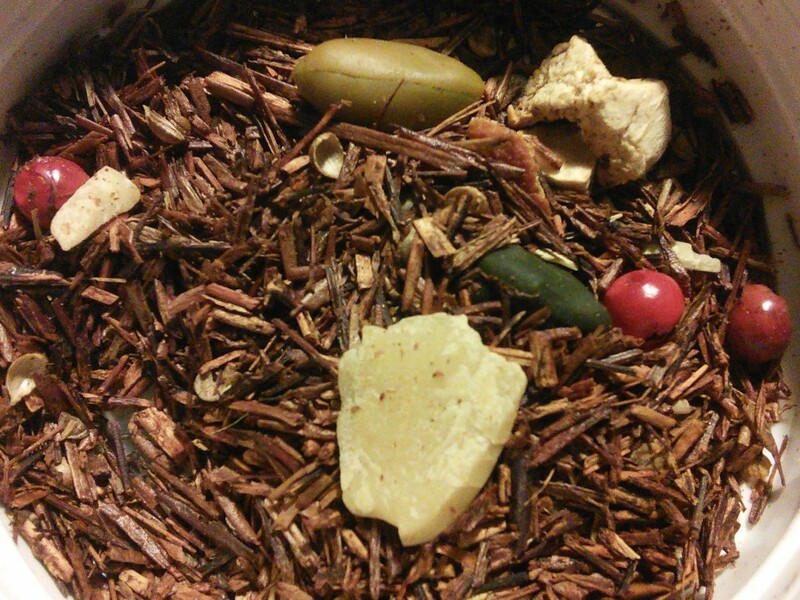 Ginger/Pepper/Orange Rooibos Tea has almond slivers pistachios, orange peels, coriander, pink peppercorns and flavoring added to the rooibos tea. This is pretty much a generic rooibos tea. It’s good if you like rooibos tea, which I do, but I think the added ingredients substract from each other rather than add, and what you are left with is pretty generic. This recipe is for “Brazilian lemonade”, but it tastes just like the lemonade I used to drink in Egypt over two decades ago. It’s delicious and refreshing, but it does require a blender and a strainer. The original recipe asks for 1/2 cup of sugar, but I felt it was a little too sweet. Next time I’ll make it with 1/3 cup. Wash the limes, cut and discard both ends, and then cut them into 8 segments each. Put limes, sugar, condensed milk, water and 3 ice cubes in a blender. Blend until the ice has disintegrated. Strain and serve over ice. My last visit to Santos Spice market ended with us buying several “exotic” drinks to try. My oldest daughter loves trying new things, and while these weren’t cheap, they turned out to be very good. 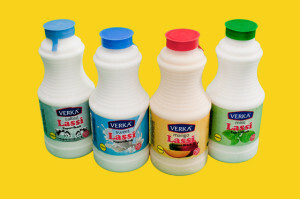 My daughter loves mango lassis, and Verka Mango Lassi is pretty good. It actually tasted more like a mango yogurt drink, though it doesn’t have any yogurt. The ingredients are milk, mango pure, sugar, cream and water. It comes in a 1 pint bottle. It’s made in the USA. Mika was excited t try Coco Passion Fruit Drink because she’d never had passion fruit or passion fruit juice before. The drink, actually bottled in Thailand, is made of water, sugar, passion fruit juice, citric acid, artificial flavor, and gellam gum – so it’s not as pure as the lassi. Still, it was very tasty. Indeed, it tasted very much like guava juice, though it was thicker than the guava juice we usually get. 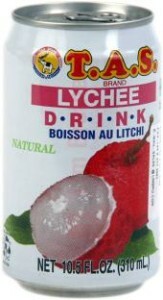 We’ve never had lychee juice before, and T.A.S. Lychee Drink was sort of a revelation. It has the same flavor profile as guava juice but it’s sweeter, if you can imagine that, with a subtle floral/rose-like flavor. We liked it, though I personally would have preferred it being less sweet. Mika thought it was refreshing. I’m thinking that I should explore lychees more. It seems like a sophisticated fruit that could enhance a multi-course menu. The drink comes in a 10.5 oz can and it’s also made in Thailand. The ingredients are water, lychee juice, sugar and citric acid. I personally liked this recipe for white hot chocolate, but nobody else was as fond of it as me. In a heavy pot, mix the white chocolate chips. Cook over medium-low heat, stirring constantly, until the chocolate chips dissolve. Mix in the milk and vanilla extract. Continue cooking until the chocolate milk is heated through, stirring occasionally. Serve and top with whipped cream. Based on Paula Deen’s recipe at the Food Network. I’m not the hugest eggnog fan in the world, but I wanted to have something to serve my Christmas Eve dinner guests when they first arrived. For some reason eggnog came to mind. This recipe, from Alton Brown, was fairly easy and pretty tasty – if you like eggnog. It was a bit too nutmeggish, however, so if I made it again I’d reduce the nutmeg to half a teaspoon. It wasn’t too sweet, which I appreciated. I followed it pretty closely, but as I needed both an alcoholic and non-alcoholic version, I only added the Bourbon at the end. Beat eggs with an electric mixer until they lighten in color. Gradually add 1/3 cup sugar and mix until completely dissolved. Mix in the milk, cream and nutmeg. Using an electric mixer, beat the egg whites until they form soft peaks. Add the remaining sugar and continue beating until hard peaks are formed. Mix the egg whites with the egg yolk mixture. If you are making both alcoholic and non-alcoholic eggnog, pour into separate pitchers and add the bourbon to one. There are many things I love about having Grocery Outlet so near my house, and one of them is their ever changing brands of tea. I used to pretty much only buy Twinnings tea (waiting for it to go on sale, as it’s usually $4 for 20 bags), but so many of the teas I’ve found at Grocery Outlet are comparable in flavor, that I am no longer tied to that venerable branch. I’m usually a black-tea girl, but I do make an exception for Earl Grey, a black tea flavored with bergamot orange oil. 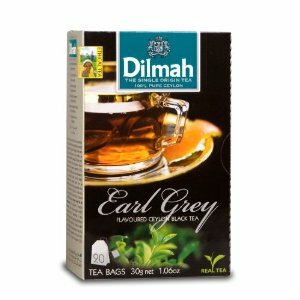 I’ve recently had those produced by Taja Tea and Dilmah, and they were both excellent. Taja Tea specializes on “saffron” teas and offers five flavors. 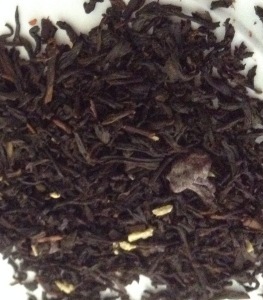 The Earl Grey is made with black tea from Argentina, and artificial bergamot flavors (I checked). Still, it is delicious. Other Taja Tea flavors also get good reviews, and I may try the red rubio and the assam if I catch them at GO. Dilmah is a Sri Lanka based, family company, established soon after Sri Lanka gained its independence. They specialize on Ceylonese tea, as you’d expect, and their Earl Grey is very satisfying. It’s not as flavorful as Taja’s, but it has nothing to envy Twinnings. It uses Ceylon black tea and artificial bergamot flavoring. They are both cheaper than Twinnings as well. I’ll check the actual prices next time I go to GO, but they’re about $1.50 to $2 per box of 20. I got a box of Impra Organic Black Tea bags at Grocery Outlet ($1.50 for 25) and I was quite pleased with it. 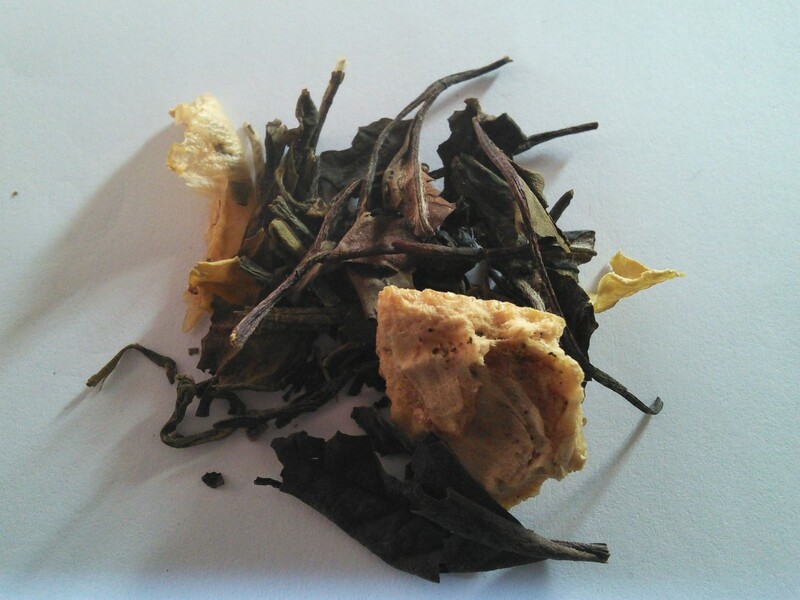 This Ceylon tea has a medium flavor, it stands well to milk and sugar. It was quite tasty, and given the great price I’ll probably buy a few more boxes. I’m a moderate tea drinker and mostly a fan of Twinings English Breakfast Tea , which I buy at the supermarket when it’s on sale or at Santos Spice Products, where a 50-tea bag box is only $5 or so. But it’s not always possible to get it at either place, so when I found myself with no tea last week, I decided to give the Barrington Tea I found at Grocery Outlet a try. At about $1.50 for a 20-tea bag box, I figured I wasn’t gambling much. And to my surprise, I ended up liking this tea quite a bit. I usually like plain black tea mixes – like English breakfast, though I’ll have the occasional cup of Earl Grey. I drink my tea with milk and sugar. Only “Pure Ceylon Black Tea” is listed as an ingredient on the Barrigton English Breakfast tea box, but I could swear the tea has some sort of flavoring in it. I can taste hints of mint and something else which makes the tea taste particularly sweet. It’s not as robust as the Twinings, but it stands well to milk and sugar, a bag is strong enough for two mugs and it doesn’t seem to over-brew very fast (I don’t usually remove the tea bag while I’m drinking the tea). In all, I’m quite happy with this tea and I’ll probably go and, given the price, I’ll probably go and pick up a few more boxes of it to keep in case Grocery Outlet stops carrying it. The tea expiration date is 11/12, so it should be good for quite a while. A final thing that I like about this tea is that the bags come in plain paper covers. Twinings’ come in sealed waxed/metallic paper bags, which I don’t think I can recycle/compost. Finally, I haven’t found much about the Barrington Tea company online – which makes me assume it’s quite new. According to its website, their corporate offices are in Palo Alto. The tea comes from Sri Lanka. I just got a box of their Ceylon tea and I’ve enjoyed it very much as well. It’s a robust black tea, with some hint of flavoring but not as strongly as in the English Breakfast. It’s very nice with milk & sugar. I’d buy it again, though now I’m curious about trying the Trader Joe’s tea, which is even cheaper. I’ve also tried the Earl Gray tea and this one has disappointed me. It’s very weak and it doesn’t really have a different spicing than the other teas – it’s just weaker. I won’t be buying it again. I ran out of strawberries, but got a lot of blueberries at Safeway for $5 – so I decided to make blueberry smoothies for dessert. Everyone agreed it was a good idea. I made them using the recipe for strawberry smoothies I made the other day, modifying it a little. The results (of my second batch) were quite good, though not as good as the strawberry smoothies. The blueberry flavor was also more subtle – if you want it stronger, use more blueberries. Update. Mika, my 7yo, made this blueberry smoothie today again, all by herself, and it was really good.